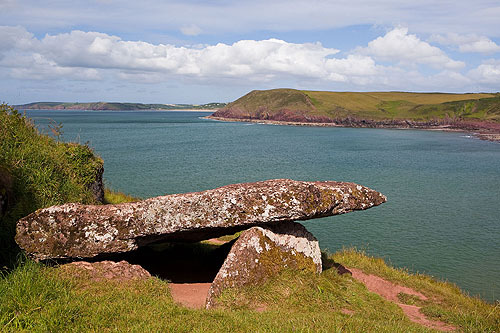 On the east side of Manorbier Bay on the coast path stands the King's Quoit , one of the most beautiful locations for a neolithic burial chamber ( dolmen / cromlech) / dating from 3000BC . An earthfast capstone, 4.5m by 2.5m and 0.5m thick, is supported by upright slabs to the N and W .
The Burial Chambers stones may be from a neighbouring outcrop of upright slabs of Red Mudstone Rock with Calcrete Nodules . The Tombs protective covering of stones - soil - turf , has eroded away.